Anterior skull base lesions can be approached through transcranial or extended endonasal, either microscopic or endoscopic, approaches. Meningiomas are the most common pathologies located in the anterior cranial fossa, and this chapter will focus on the endoscopic endonasal approach for the management of tuberculum sellae and planum sphenoidale meningiomas. 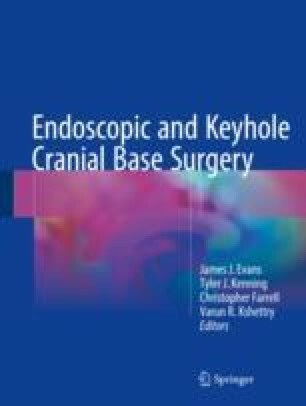 Key considerations related to the specific indications for the endoscopic endonasal approach include sphenoid sinus and tuberculum/suprasellar notch anatomy, parasellar extension of the tumor, or encasement of neurovascular structures. When proper indications are complied, the endonasal route represents a safe and effective surgical module for the management of tuberculum sellae and planum sphenoidale meningiomas.